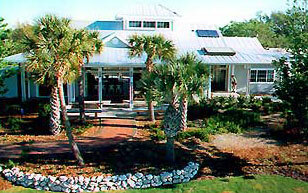 The Florida House Learning Center is a demonstration home and yard featuring an environmentally-friendly building, rainwater harvesting, and sustainable landscaping materials and methods. 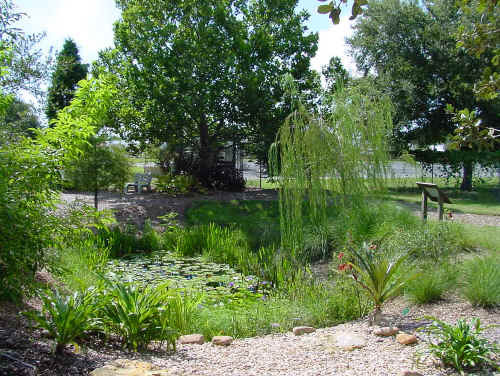 The landscape was designed to be a "Model Florida Yard," demonstrating the use of native and drought-tolerant plants, xeriscaping, rainwater catchment, pervious walkways, and other ways to reduce detrimental run-off into Florida's estuaries and bays. In Florida, which boasts an abundance of rain every year, rainwater harvesting focuses more on protecting a precious resource than on catching a limited resource. The Florida House is located in Sarasota, Florida, an area that typically gets over 50 inches (127 cm) of rain a year. Much of this rain normally becomes runoff on the streets, catching pollutants such as fertilizers and pesticides along the way to the lakes, streams and waterways. This is a problem throughout parts of Florida and increasingly in other areas as well (e.g., Alaska and Washington). By harvesting the rain rather than letting it run its natural course, residents can dramatically reduce the storm runoff and its associated pollution of waterways, reduce their monthly water bills, postpone the need for costly stormwater infrastructure improvements, and have healthier plants. The Florida House Learning Center, which opened on Earth Day in 1994, has been visited by tens of thousands and clearly demonstrates environmentally appropriate design strategies and technology for living in southwest Florida. It is the culmination of a community effort involving contributions by hundreds of organizations, businesses, government agencies and individuals. The project is a joint venture of the Cooperative Extension Service for Sarasota County (which operates the facility), the Sarasota County Technical Institute, the Southwest Florida Water Management District, and the non-profit Florida House Institute. The "Model Florida Yard" at the Florida House demonstrates the use of harvesting rainwater, xeriscaping, edible landscaping, micro-irrigation, composting, and recycled mulch, as well as the reduced use of fertilizers, pesticides, water, energy, and reduction of detrimental run-off into our waterways. Micro-irrigation, recycled mulch, and 90%+ native plants save water in the large well-landscaped yard. "The rainwater collection system was included in the project because it's important to show a better way of managing water locally", states Betty Alpaugh, project coordinator at the Florida House. Average water per capita use in Florida has been reduced by almost 40% - from 140 (530 liters) to 88 gallons (333 liters) per day, in the years since the Florida House opened. Residents are learning easy ways to conserve and help the environment, with the help of some new technology. The system includes both a traditional rainwater catchment system, as well as a greywater system to fully demonstrate ways to maximize water usage. Florida House features a dramatic storm water pond and ground water recharge area. The pond contains a liner at the very bottom to hold around 18 inches of water year-round, but the sides are sandy. All cistern overflow is directed into this pond to recharge back into the ground. · closed-loop hot water recirculating system to bring hot water at the touch of a button. The rainwater catchment system uses fairly standard equipment (tanks, gutters, pumps and valves), but has some unique aspects to it - like using rainwater in the washing machine. "The facility is not 'futuristic' at all", says Alpaugh. "It looks like a traditional Florida 'Cracker' style home - everything in it is readily available off-the-shelf." No single innovation will succeed in saving our natural resources, but by cultivating an awareness of the multitude of ways we can be environmentally friendly, the Florida House is contributing significantly to a future based on sustainable development. The Florida House is a marvel to visit, not just for its innovative water conservation features, but also its holistic architecture (passive solar orientation, large eves to cut down on solar gain, bamboo flooring); highly efficient electrical use (PV solar system, 18 SEER HVAC, fluorescent and natural lighting, high efficiency kitchen appliances); and use of recycled and recyclable materials to prove houses can be built for sustainability. Visit the Florida House, located on the campus of the Sarasota County Technical Institute at 4600 Beneva Road South. It's open year-round on Saturdays 1PM-4PM; May - November: Tuesday - Friday 10AM - 1PM and December - April: Tuesday - Friday 10AM - 3PM.